The rise of home renovation shows in America has helped to fuel the excitement that many homeowners feel when upgrading their houses into the perfect home. Being able to upgrade your space to improve the livability and value of the home is a popular project that many homeowners take on in earnest. Unfortunately, many aspiring renovators fail to take into account their budget, as improvements can quickly drive up the price tag. One quality approach to kitchen remodeling involves cabinet refinishing services, where contractors can leave your existing boxes and spruce up the doors and hardware, vastly improving appearances without the high price tag. 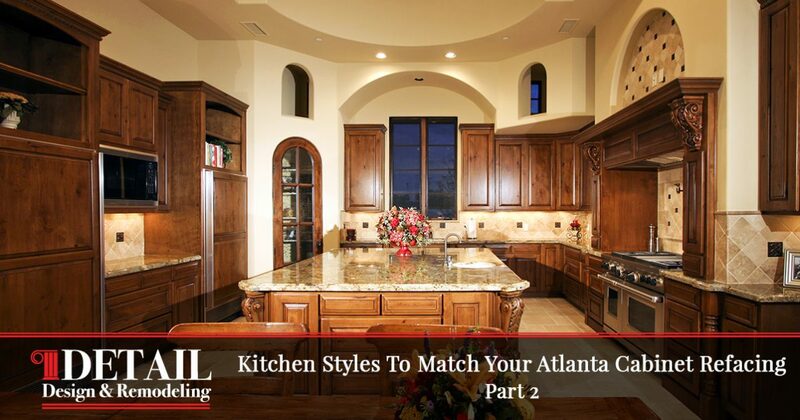 Detail Design & Remodeling is proud to be your source for quality cabinet refacing in Atlanta. Our team works hard to craft personalized results to match your kitchen’s unique style. While we specialize in cabinet resurfacing, our team is here to deliver all-over remodeling services to create a style that you’ll love for years to come. Today, we’ll continue or look into kitchen styles that may be ideal for your space. If you’re in need of custom cabinet services in Georgia, including repairs and refacing, be sure to reach out to our experts! A lot of individuals favor the feel and romance of Mediterranean stylings. While it can be challenging to get the ambience of this style right, succeeding in doing so can create a huge bonus to the enjoyment of your kitchen space. Be sure to look for rich colors and tones that consist of cobalt, russet, and other earthy schemes that are sure to make a splash. Homeowners have been known to achieve authenticity by highlighting the smaller details, such as ceramic centerpieces, rush seats and other Mediterranean furniture options, and stressed surfaces. Your space can be greatly upgraded for little cost with kitchen cabinet refacing, where we can take warm wood tones to help enrich the scene. Harnessing the essence of a sun-warmed kitchen can be difficult, but the payoff for your Tuscan kitchen can make it all worthwhile. This unique style strives to capture the essence of a modest kitchen in a grand capacity. It’s important to incorporate fixtures and products that provide warmth and comfort. By focusing on handmade tiles and bright flooring options, you can create a space that truly feels like home. Our custom cabinet professionals can create amazing results for your cabinets, from distressed wood patterns to beautifully painted surfaces and more. The passion that many people feel for modern culinary delights can equate to preferring a kitchen style that is beautifully sparse. Home remodelers like to focus on creating that restaurant space in the home, utilizing features such as exposed bricks and steel appliances. Being able to minimize your clutter while maximizing form and function can be a challenge, but having the right remodeling team on staff can help in attaining success. Our cabinet refinishers can work to match your design plan, installation wood, metal, and brick materials in a seamless fashion to create an industrial kitchen that’s as useful as it is stylish. One interesting style that has gained in popularity over the last couple of years is the heavy use of monochrome tones in your color scheme. Balancing a fresh mixture of black, white, and grey tones can create a futuristic feel that is sure to impress your guests. Homeowners can take advantage of a wide range of fixtures and accents for this approach, creating a dynamic spattering of colors to keep the kitchen fresh, clean, and full of life. Cabinet resurfacing can make a big difference here, whether you’re in need of monochrome paints or an offsetting veneer to make a visual impact. When it comes to remodeling the kitchen, homeowners have a nearly limitless amount of style options to choose from. The combination of these elements will help to create a dynamic space that will increase your enjoyability of your kitchen in addition to a nice bump in your home’s value. Detail Design & Remodeling is here as your source for quality cabinet refacing in Atlanta and Dunwoody, providing personalized results with the goal of exceeding your high expectations. Whether you’re looking for custom cabinets or simple cabinet refinishing, our team is ready to show why we’re a top-rated source for the job. Contact us today to learn more or to receive a quote on your upcoming kitchen project!